This is an introduction to Billy’s Blog, brought to you by best-selling author Pippa Mattinson. If you haven’t read any of Billy’s adventures yet, this is probably as good a place as any to begin. Billy’s Blog explains how Billy came into our lives, and why I began this journal. If you are familiar with my dog blogs, you’d be right in thinking that this is a bit of a departure for me! 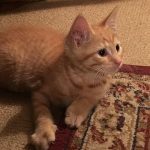 I hadn’t raised a kitten for over thirty years, when I decided to find Billy. And a bit daunted by the responsibility of looking after something so very tiny. What if one of the dogs trod on him. What if I trod on him! 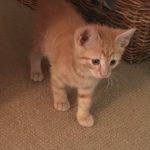 There was so much to think about before bringing a small kitten into our dog-filled home. 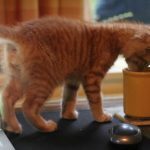 What to feed the kitten, how to litter train him and where to put his litter trays. 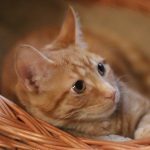 How to introduce our new kitten to our three dogs, whether they would like him or he would like them. Whether or not the kitten would scratch my grandchildren and how to protect them from his needle sharp claws. Whether he should be allowed outside at some point, or should be an indoor cat for his whole life. 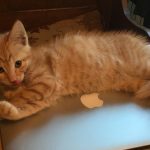 And when I collected my kitten, would he have been properly socialised or would I have to spend time ‘taming him’? 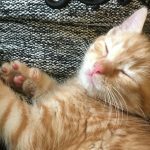 Can Cats Have Allergies? Looking at allergies in cats themselves. This was perhaps my biggest worry and I spent some time watching these interesting videos about taming feral kittens. I was well prepared on that front. What I wasn’t well prepared for was the major allergy attack that I suffered on Billy’s third day in our home. And the ensuing drama over whether or not I was even going to be able to be in the same room as a cat, never mind keep my own. But more of that later. 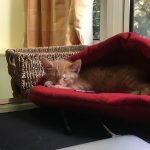 Then once Billy began to settle in, I had more things to worry about, including how much he should weigh, whether or not he was growing fast enough. I decided to record everything that happened during the time Billy shared my life, however short a time that might be. It is my hope, that my scribblings might be a comfort to others with similar problems with new kittens, or who had similar worries. You’ll find out for example, how much Billy weighed at each point in his life. What he ate and when, and how much of it. 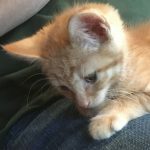 I’ll be sharing what Billy likes to play with, and how I made the choices and decisions I did make, to try to give Billy the best life he could have. I’m not a great photographer, but Billy is very photogenic and I find if I take enough photos of him some of them come out pretty well. So you’ll find plenty of them here. Please note, you’ll find dates entered in the text of some of my blogs, that don’t match the publishing date of the blog post. That’s because I didn’t publish my journal entries until I was confident that Billy would be able to stay with me. It was ‘touch and go’ for a while, as you will see. Our last cat, Gadget, died peacefully in her sleep at 18 years of age having brought much joy and happiness into our lives. She was a gentle companion to my four children as they grew up, and you could not have hoped to meet a nicer cat. She was a very hard act to follow. And for several years, we didn’t try. The natural place to begin our search was the rescue shelter where we found Gadget all those years ago. 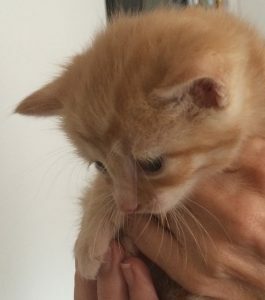 And to my delight, they had a beautiful ginger female cat and one remaining kitten. Sadly, there were a great many people interested in them both, and few other young cats available. 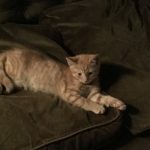 Though the shelter took my details, and liked that I work from home and that my cat would always have company, we didn’t hear from them again. Perhaps the dogs put them off, I don’t know. 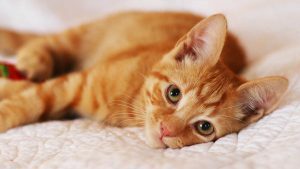 My next step was to search the internet for local kittens, and by now, I had my heart set on a shorthaired ginger tabby. 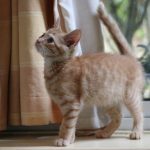 It seemed that I was not the only one, and in mixed litters, the ginger kittens were always snapped up first. But eventually, we found Billy, in a town just a few miles away, by phoning the very day the advert was posted and putting a deposit down next day. 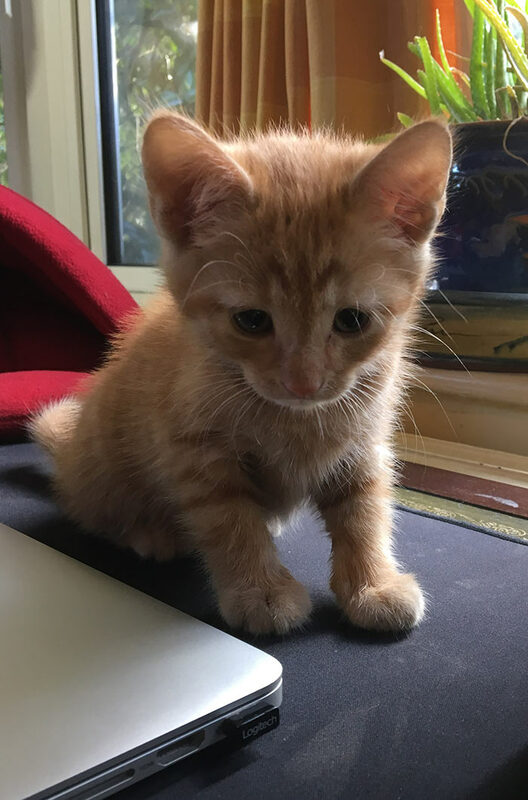 Billy was just four weeks old, and waiting for him was going to be hard! While we waited for Billy to grow big enough to leave him mother, I spent time researching as much as I could about cats. It was fun reading up on feline health and development. And on catching up with what’s available for kittens and kitten owners these days. Quite a lot as it turns out! I bought some kitten caves, and kitten toys. I read up on cat parasites, cat vaccinations, and current thinking on neutering. 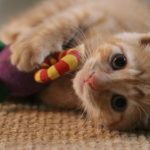 Delved into some fascinating aspects of cat behavior and biology. And together with my daughter Lucy, got this website under way. The first thing I had ordered for Billy was a big litter tray, complete with hood and catflap door. There was no such thing when I raised my last kittens thirty years ago. Back then, a litter tray was a plastic box, with a bottom and four sides, and that was that. But as I read further, it soon became clear that while hoods and flaps might be great to shield people from cat poop, they are less popular with kittens. So the hood was put to one side for the time being. I also needed to decide where to put the litter tray and indeed where to keep Billy for the first few days. 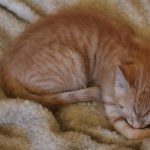 Like puppies, it is easier to make sure a baby cat is litter trained and can find his litter tray, if he isn’t able to wander off all over the house and get lost. I also needed the litter tray to be somewhere that my dogs aren’t allowed (because dogs are notorious for snacking on cat poop) and in a room with a washable floor. The only suitable place upstairs was the bathroom, but I didn’t want Billy to be shut away there on his own for several days. That also meant Billy would be able to have company while I worked. We’ve also been thinking about how we are going to keep Billy indoors. Bearing in mind that kittens are quick and can squeeze through tiny gaps. We have decided to lock the double patio doors in both the kitchen and the living room, so that people can only come in and out of doors where there is a porch, to create an ‘airlock’ just in case Billy slips through. At last it seemed that all the planning and preparation was done. All that was left was more waiting. Will Billy ever be mine? As the days passed by, I began to worry. I worried that Billy might drown in the toilet, and printed out notes to go on the bathroom doors reminding people to keep the lids closed. I worried that Billy’s breeder might be keeping all the kittens in a dark shed where they won’t learn to be friendly. Which of course she was not. It was just my imagination doing what it does best. As you can see, rational thought is not my strong point when it comes to kittens. Finally, finally, the waiting, and the worrying, were over. Monday 17th October arrived, Billy would be 8 weeks old tomorrow, and it was time to collect him and bring him home for good. A new adventure was about to begin! I just rescued a sweet fun beautiful black tabby kitten, she had a rough beginning, she was thrown out of a car window and my husbands friends chased her down and she came home to me injured that day😭after a vet visit they told me her back leg had been ripped out out the pelvic bone, broke in 3 places and needed amputating😨we did everything to keep her leg but wasnt possible so she had her surgery 😞amazingly she is awesome, all bouncy, and inquisitive, loves to purr, just a normal precious kitten ! !😍😄all my fears were put to rest when she came home knowing with her 2 older sisters Dallas and Talyn she would be loved, nurtured and away from all of her rough past 😍🤗we love her to pieces and feel lucky that she is our new baby 😻we named her Alaja (alaysha) after the 2 men who caught her !! 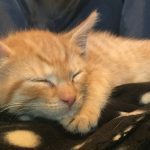 New Kitten Day Three – Allergy Alert! 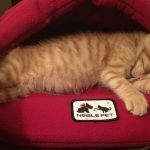 Cat Allergy Test: The Results!